Row 34 purchasing director Phil Peterson, UNH's Michael Chambers, Row 34 Chef and partner Jeremy Sewall and Row 34 Farm manager Gunnar Ek (l-r) harvest steelhead trout. Photo by Emily Hagen. Once a week, Jeremy Sewall feeds the fish. Not in an aquarium — “oh, that would be far cheaper,” says the chef and partner of Row 34 in Portsmouth and Boston and Island Creek Oyster Bar in Boston — but in a 41- by 22-foot cage near UNH’s pier in New Castle, in the university’s innovative integrated multi-trophic aquaculture (IMTA) project. For several years, Sewall has taken an active role in the IMTA, a unique system that mitigates the environmental impact of fish aquaculture by growing sugar kelp and mussels on the same floating platform to take up excess nutrients from fish waste and provide additional products. 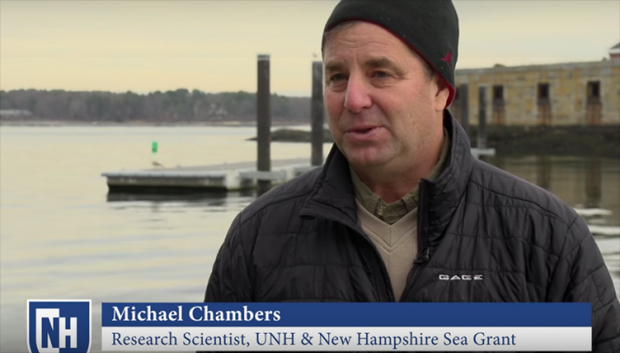 When the project, led by Michael Chambers of NH Sea Grant and UNH Cooperative Extension, faced a funding shortfall, Sewall stepped in to purchase juvenile fish and fish food. He visits regularly, often bringing his staff to “meet” the fish, an effort he says enhances their ability to describe them with knowledge and passion to customers. And while some of the prized steelhead trout end up in Sewall’s restaurants, “he’s not doing it to make money,” says Chambers. “He’s doing it because he loves it.” He’s not alone; chefs, fishmongers and seafood lovers all clamor for the salmon-like UNH steelhead trout. To meet increasing demand, Chambers is now scaling up his system at an open ocean site nine miles off the New Hampshire coastline. The commercial-scale AquaFort will engage new partners: Local fishermen, led by New Castle lobsterman Damon Frampton, will assist in the system’s daily operations. “They have boats, they’re on the water, they know the water,” says Chambers. What’s more, a system like AquaFort, which brings the stability of aquaculture to the uncertainty of commercial fishing, could supplement these fishermen’s income. Scheduled to deploy in summer 2019, the National Oceanic and Atmospheric Administration-funded AquaFort will produce about four times as much product as the current IMTA. Chambers anticipates AquaFort will be a powerful proof-of-concept that could reinvent aquaculture on the Northern New England coast. Jibu tapped UNH expertise to expand its affordable drinking water franchises to five countries throughout East Africa. Photo by Sandro di Carlo Darsa (TIGRE). If UNH research links fishermen and restaurateurs through a delicious fillet, it also connects entrepreneurs and people in East Africa through affordable drinking water, thanks to the expertise of UNH’s Peter T. Paul College of Business and Economics. 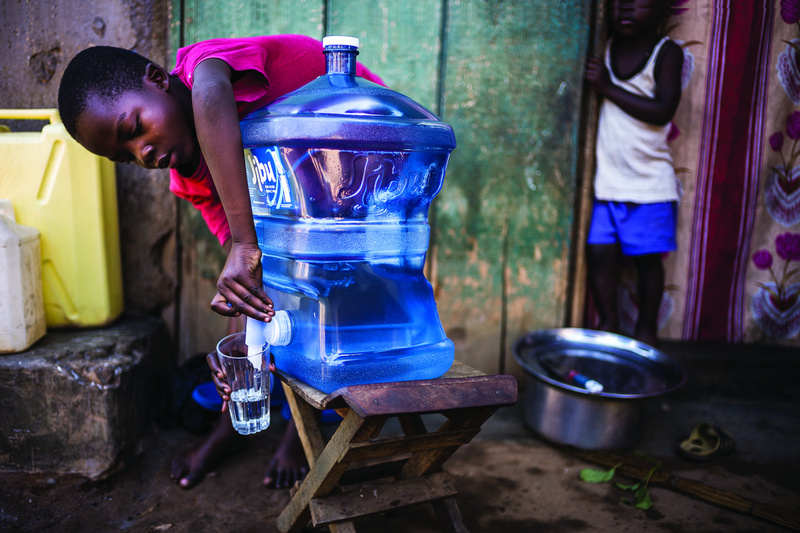 It’s here in Durham that Jibu, a for-profit mission- driven company that sells “radically affordable” clean drinking water in East Africa, got a boost from UNH’s emerging leadership at the intersection of two fields it already dominates: franchising and social innovation. Since 2002, UNH’s Rosenberg International Center for Franchise (RICF) has been a global thought leader in franchising. Directed by associate professor and Rosenberg Chair in Franchising Hachemi Aliouche, the RICF created the Franchise 50 Index,TM the first stock index to track the financial market performance of the U.S. franchising sector, and the companion RIFC International Franchise Attractiveness Index. More recently, RICF has partnered with UNH’s interdisciplinary Center for Social Innovation and Enterprise (CSIE) to apply the principles of franchising to social enterprise: businesses such as Jibu that contribute to a more socially and environmentally sustainable world. Called social sector franchising, it can address the issues of scale that few social enterprises have achieved. research and practical expertise in social innovation, directly to social sector franchises. CSIE’s social franchising accelerator program matches social entrepreneurs from around the world with volunteer members of the International Franchise Association for a nine-month boot camp. UNH students work alongside them as research associates.